The Attack Democrat--Nothing Conservative Here: What happens if the debt ceiling isn’t raised? A new bipartisan report. What happens if the debt ceiling isn’t raised? A new bipartisan report. The Bipartisan Policy Center (BPC) has issued a report outlining day-by-day what would most likely happen if Republicans and Democrats cannot reach agreement on raising the debt ceiling by August 2nd. Their report provides an excellent overview of the problem the Treasury would be facing. First, BPC looks at projected inflows (revenues) and outflows (expenses) for August. Like most businesses, the federal government’s revenues and expenses cannot be expected to balance from day-to-day or month-to-month even if the budget is perfectly balanced for the entire year. Some days and months the government receives more money than during other days and months. Some days and months it has more expenses than other days and months. Any person who has run a business and/or worked for themselves understands this. That’s the reason businesses usually have to have some line of credit they can borrow against during the lean months to pay for ongoing expenses. BPC estimates that the federal government will receive $172.4 billion in revenues (inflows) during the month of August and have $306.7 billion in expenses (outflows). These expenses (outflows) are already committed; Congress has already obligated the government to make these payments. The analogy would be to bills in your household budget that you are obligated to pay such as your rent/mortgage payment, car payment, utility bill, etc. etc. 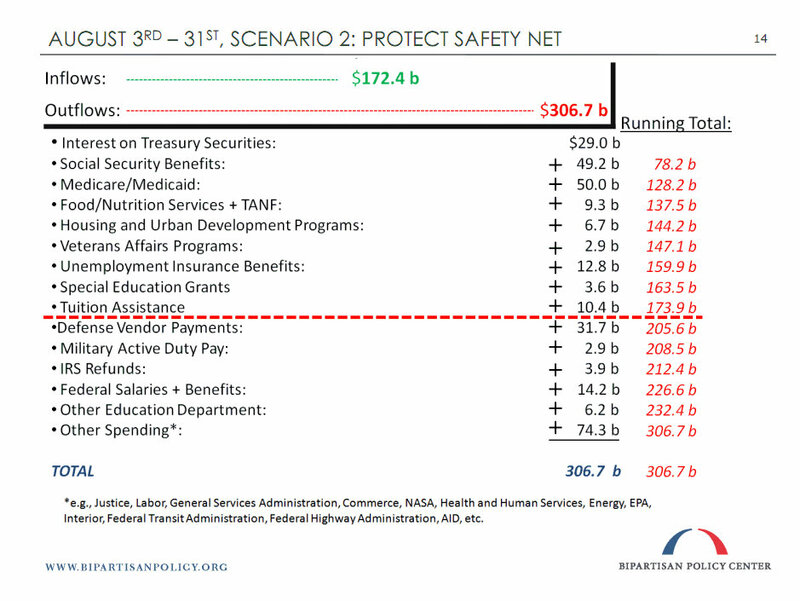 So, in August, the government faces a $134.3 billion short fall. Now, since the government has already reached its debt ceiling and, presumably, can’t borrow any more money, it has only $172 billion to use to pay bills that are coming due in August. Someone, presumably the Secretary of the Treasury, will have to make some choices. Which bills should he pay? Again, the analogy would be to you having those household bills to pay in a situation in which you lost your job or your paycheck fell short of the bills due. You would have to choose whether to pay the mortgage or make the car payment, pay the utilities or buy food, etc. Note: There is some debate over whether the Secretary of the Treasury, or anyone in the administration, has the authority to make those decisions. But, let’s assume they do. 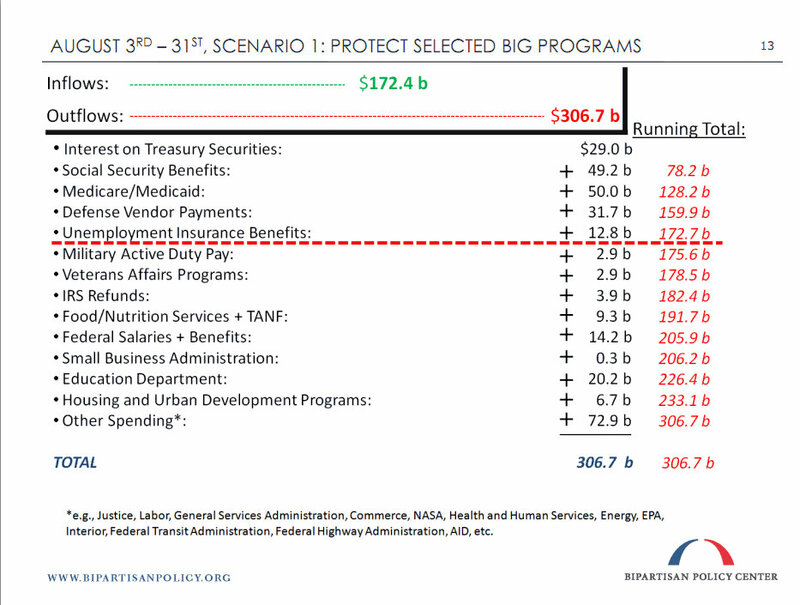 Given a shortfall of $134.3 billion, the Treasury must choose which bills to pay. Unlike you, the feds have lots and lots of monthly payments—80 million in fact. So, someone is going to have to sort through 80 million bills that need to be paid and eliminate 40% to 45% to get down to the $172 billion. That’s probably impossible so the Treasury will have to just lump bills together in major categories and pay those it can. As you can see, none of these are particularly good choices. Regardless of scenario, innocent people are going to be hurt and hurt bad. Soldiers in combat might not be paid. Students might not be able to go to college. Schools might have to close. Small and large companies with Defense Department contracts might not receive payments and might have to start laying off workers. Small businesses such as suppliers to government agencies or restaurants and retail stores that depend upon government employees as customers might have to close. It is easy to see how the entire economy would be affected. Now, Republicans might argue that they want us to start making choices about spending so making these tough decisions is a good thing. There are two problems with this argument. First, this is not FUTURE spending, it is spending CONGRESS has already authorized and obligations we have ALREADY made. It is similar to that car payment you have. You have already bought the car. Not making the car payment is NOT the same as NOT buying the car. You've already made THAT decision. Second, since these are obligations the government ALREADY has, by not paying these bills now we are just putting off the day when they must be paid. Companies and individuals that are legally due payment will expect eventually to be paid and we may, in fact, owe them interest if we delay payment. Third, no one--least of all Congress--should want the executive branch or even just the Secretary of the Treasury to make the decisions concerning how the federal government will spend tax money. That's the job of Congress, that's one of the key reasons people are elected to Congress. And, there is a process for making those decisions, it is called the budget process. 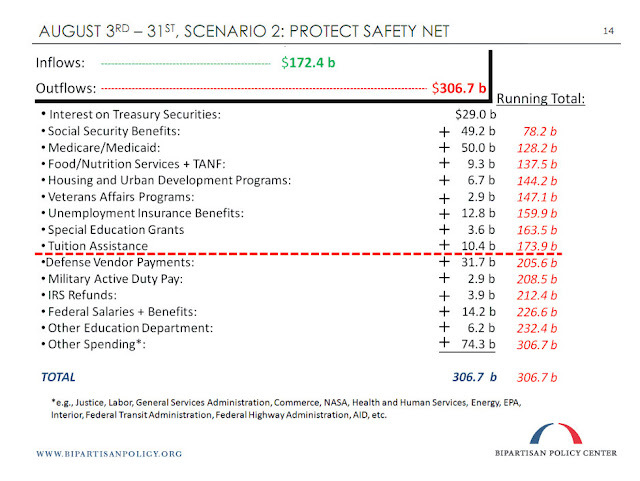 That's the time to make decisions about which programs to fund and which to deny funding. In short, if Congress wants to avoid raising the debt ceiling, all it has to do is to keep budget authorizations BELOW the ceiling. It would be like a father agreeing to help his daughter buy a new car by co-signing the loan, then when payment came due the jerk saying he didn't think she should have a new car so he wasn't going to make the monthly payment. No, once you take on the obligation, you pay the bill. You've already lost your chance to say NO. It is the same with Congress. It gets worse. The above two scenarios look at the month of August as a whole. But, that’s not the way the government runs. Bills come due at different times during the month. 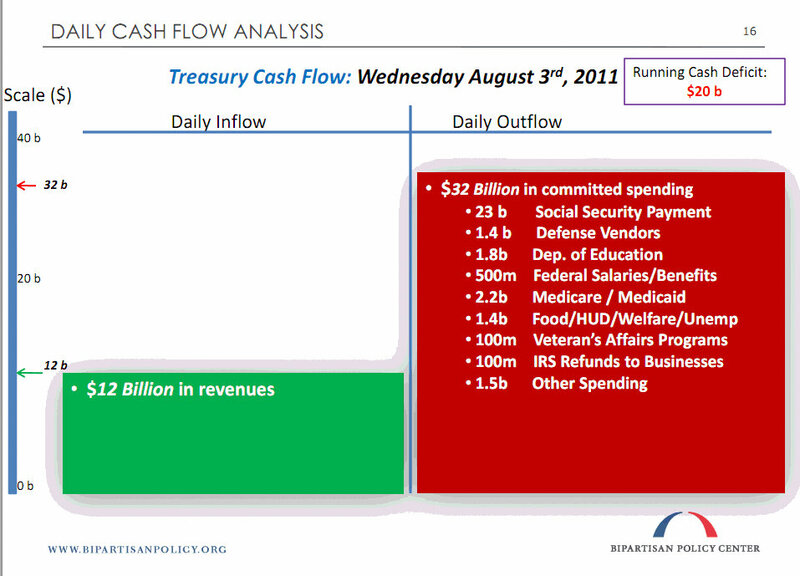 Each day the government receives revenues (inputs) and has expenses (outflows) and they vary from day-to-day. Therefore, the trouble starts right away—as soon as August 3rd. CBO shows us what the federal government’s day-to-day cash flow problem might look like. 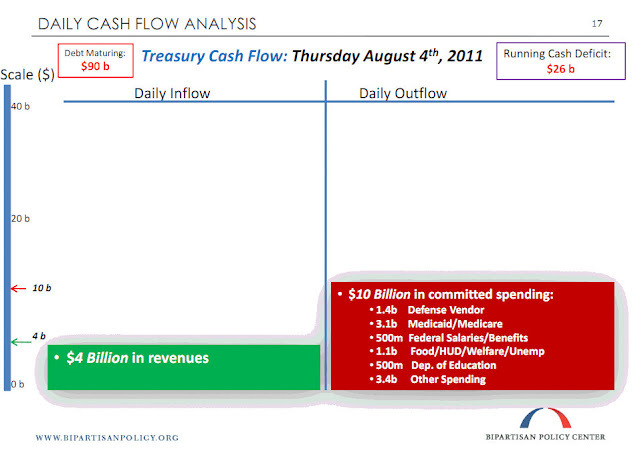 Here are graphs showing the projected Treasury cash flow problem on Wednesday, August 3rd and Thrusday, August 4th. Again, it is not pretty. Now you understand why we just need to go ahead and raise the debt ceiling. Otherwise these scenarios or something very much like them might become reality. We don’t want that to happen. TELL CONGRESS TO QUIT PLAYING SILLY GAMES--RAISE THE DEBT CEILING NOW!! !